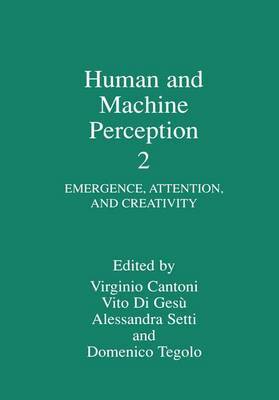 The following are the proceedings of the Third International Workshop on Human and Machine Perception held in Pavia, Italy, on September 14 -17, 1998. This edition has been under the auspices of two Institutions: the Cybernetic and Biophysics Group (GNCB) of the Italian National Research Council (CNR), the Centro Interdipartimentale di Scienze Cognitive, of Pavia University and the Centro Interdipartimentale Tecnologie della Conoscenza, of Palermo University. A wide spectrum of topics is covered in this series, ranging from computer perception to psychology and physiology of perception, for analysing and comparing biological and artificial approaches. The theme of this workshop was focused on "Emergence, Attention and Creativity". The workshop structure consisted of five modules each one composed of two invited lectures (dealing with solutions in nature and machines respectively) and a panel discussion. The lectures focused on presenting the state-of-the-art and outlining open questions. In particular, they sought to stress links, suggesting possible synergies between different cultural areas. The panel discussion was conceived as a forum for an open debate, briefly introduced by each panellist, and mainly aimed at deeper investigation for the different approaches and strictly related topics. The panellists were asked to prepare a few statements on hot-points, which were delivered in advance to the participants as a guide for a qualified discussion.